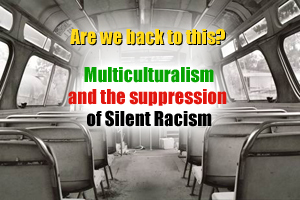 Multiculturalism and the suppression of Silent Racism | Innovation, Inspiration... Atlas Unleashed! I’m writing this for quite a few friends of mine who live with this year-after-year, month-in month-out… who live with it and bear that burden because they always have. See, of all the industries that I’ve worked in, comics is just rife with Silent Racism. Yeah, nothing. Sure, all these creators have worked to create an online digital footprint… but that still doesn’t help with the treatment they have in the established circles. Does it mean that they aren’t famous enough? I doubt that, as other much younger, and less experienced talent has received far better treatment. It’s time we all changed that and made the media, press, museums and even search engines aware that we live in a world of multiple viewpoints, multiple perspectives, and multicultural talents. I’m personally sick of seeing art shows excluding these talents whether they be friends of mine or not. It’s just a form of Silent Racism, and it’s just ripping the heart out of these stunningly talented individuals. Much has been said recently about the lack of women creators in the industry. I’ll go one further… where are the multicultural women creators? They certainly exist, but at such a short list it’s mind-blowing. So why am I so angry about this? I keep running full steam into this fact: many of these creators have had enormous financial troubles over the years, and our present age is no picnic either. What hurts more is their exclusion from the more lucrative regular paying gigs at the two largest North American publishers. And before either of these publishers throws a brick at Atlas Unleashed, go take a look at whom we’ve been working with. Certainly, if an independent publisher like myself can see the intrinsic value of their creativity…well let a few multicultural creators produce your professed new “Ultimate Spider-Man”. Why not let at least ONE creator on this title be a man or woman of color? A decade ago, a few friends and I were speculating on whether Marvel Comics understood that a large core of their audience was multicultural. That the readers and fans of their products who were multicultural were the difference between a lack-luster seller and the golden goose. The conversation started over the immense success of the Blade films, and quickly moved to the appeal of T’Challa, the Black Panther. We went all over the possibilities and concluded that they must be clueless or else they would have made some effort to engage this audience. It was Grey Williamson who suggested that eventually they’d be forced to see the value of that audience or else those readers would leave them cold. And now with sales figures in the toilet, Marvel Entertainment brings us…Miles Morales, the Ultimate Spider-Man! I’ll leave you with this thought… a decade ago Grey Williamson and I were discussing new projects. Grey posited to me about what ethnicity our lead character, Crimson Rose was. And he caught me flat-footed with that question. It didn’t matter what her ethnicity was to me, just what religion she was. Surprisingly, out of this question grew a new take on her mentor and legal guardian. It made sense that we use the world outside our window to show how she had become displaced from the comfort zone of the world she had known. The layering of her back-story grew to embrace the new borough of the city she lived in, and encased her life-defining moment as an affirmation of life and the spirit of all people. Grey: Many know of your electrifying visuals and intelligent director-level storytelling…but NONE of them know of your Spirit as a writer. I know, and I will always be in your debt. Thank you Mark for your kind and courageous words, and your honesty. The strength of the comic book medium lies in how daring and adventurous the stories and art can be without additional budgetary concerns. If comic books do not showcase new, diverse, and challenging ideas, then as a medium it falls far back behind screen and prose… instead of being the leading inspiration that it can be. Even with the success of the comic-generated film industry, American comics have become stale. Maybe now the Internet can provide hope for expanded visionary product to reach the audience directly and inspire a new generation of fans. I’m just glad to be a part of the possibility. No debt, just mutual respect. It Came from the Radio!